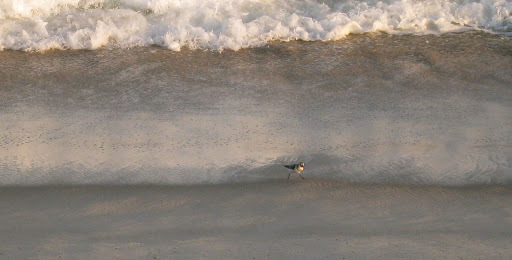 I had been like this little fellow, just at the edge of the waves. I wanted to go in, get started, get my feet wet, but I had to wait. I had the procedure to implant a port in my chest (it’s a little disk under my skin, with a line that runs up my jugular vein and under my collarbone — all the cool kids have them, you know). And then I waited. Again. My sister Sarah came to help me through the first session of chemo, but it was a week before I could start. That was a terrible week of waiting, and she helped me stay sane. I was all ready, fully-coping with this next big idea. The port was – and still is, at times – uncomfortable and frustrating, so in the end we were glad that I didn’t go from the operating room to the chemo room on that Thursday. My first treatments were a week ago, on Thursday and Friday. On that first day I was a little giddy, not knowing what to expect or feel. I wasn’t scared, exactly, or perhaps I was beyond that, but I did know that the only thing to do was to go into that big room and get on with it. That day turned out to be one of the most amazing and powerful days I’ve ever had. Once I was there, in my comfortable chair, surrounded by six or eight other women just like me, I relaxed and let the day unfold. I really felt like it was unfolding, too – each next new thing had its place, all the drips and the drugs and the soft talking and the quiet, all the dozing and the reading and the knitting, the short conversations, the passing of time. I remember smiling; it was that big. When that first day was over, when the last drop had dripped, Rho brought me home and I slept to be ready for the next day, and more of the same. And then when that day was over, Judy brought me home and I lived a lost weekend. What I wonder about chemotherapy after my one encounter with it is this: is it ironic that I am assaulting my body with chemicals, and feeling this way, so I won’t get sick again? Or is it just what it is, a means to a good end? From my perspective on the other side of that lost weekend, I’m glad I was there, and glad I am here. So about the knitting … I’m still crazy about the Narragansett Bay – Lisa Lloyd – Fine Fleece patterns. 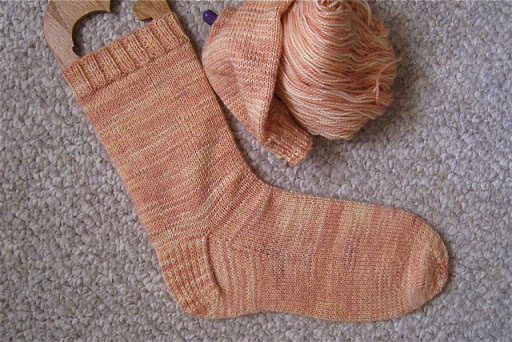 These are the socks, in beautiful Foxfire Fibre Fox Sox yarn. The color is called Willow. 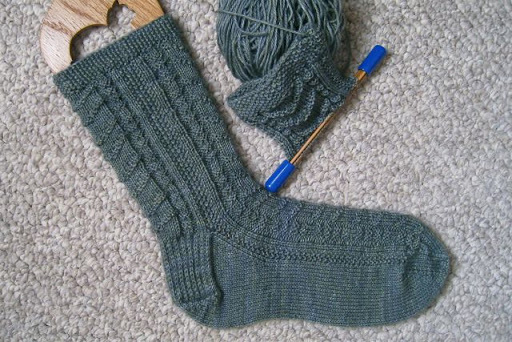 I’m going to work on the second sock this week and see if I can get it finished. 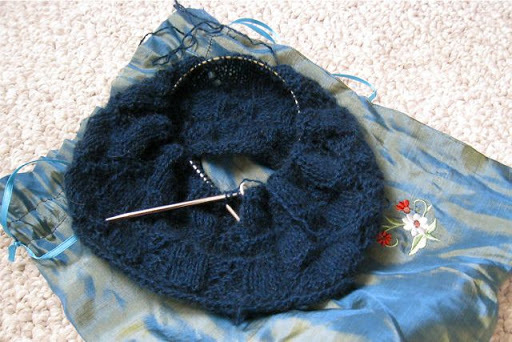 When the new Knitty came out, I was drawn to the Abby Cowl by Amy Singer. It seemed simple enough, and I knew I had to have some yarn in my stash that would work. A special ball of Qiviut rolled out of its silk bag and right on to my needles. I’m not sure if I have as much yarn as I’ll need to make it the full 16″, but I can always stop when I run out. I think I’ll be warm enough no matter what. This is the almost-finished pair of socks that I have been calling my Waiting Socks. The yarn is Sundara’s Tulip colorway. I cast on on May 27th, and since then they have been my waiting room knitting for every appointment, procedure, test, and treatment. I want to finish them too, so I can wear them to keep my feet warm the next time I am reclining in that comfy chair at the oncologist’s office. I’m sending thanks and love to everyone who has been keeping me in their thoughts and sending juju – the comfort and support I get from all that energy keeps me going. I’ve been spending this week learning how to navigate this new territory of side effects, changes, expectations, assumptions about my body – new rules, almost. I don’t mind, somehow, because at least I’m on my way again, and no longer waiting. We can knit our Qiviut together! (I thought the same thing when I saw that pattern. )The New rules are disorienting – sometimes in a good way – sometimes not – but just different. I am amazed at how many brain waves are used noticing, adapting, … deciding to move on. It is what it is…a rocky means to a wonderful end.Wonderful knitting! I’ve been wondering how you were doing. I’m glad you’re moving on to the next phase. Thinking about you!! oh dear one – how very awesome to have you here blogging after only a week has passed.I’m glad that you are able to knit through the treatments – and hopefully it distances you a smidge from the assault by the drugs. 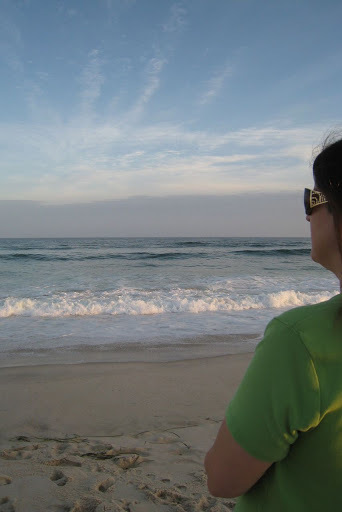 I hope that you are able to get to the ocean many times before the next treatment – and, as you have said to me, arms out.. and lean into the wind. Thanks for reminding me that I also had an ounce of qiviut marinating! Our matching cowls look to be in the same state of not quite done yet-but almost.Oceans of good wishes being sent your way. Thank you for sharing what you are going through. A friend’s daughter just had a port installed and went through her first session of chemo and now I feel like I understand her a bit better. My thoughts will be with you this fall. Thank you for sharing your journey, and the amazing inspiration. All the best to you, and to your sister for being such a good caretaker! I’ve been thinking about you and hoping you weren’t still waiting. Thanks for sharing your experiences. Chemotherapy seems like such a strange thing but when you think about it, lots of medical treatments are assaults on your body so you can get well again. I like the waiting socks. Sending healing thoughts and energy your way. You are my hero and I look forward to each one of your posts. May God bless you and may you find strength and a quiet spirit. I’m thinking about you, dear sister and friend, sending lots of love and support in your direction.Chemotherapy is very harsh; cancer is harsher. I wish they had developed a more gentle way to send it packing.Much love to you! Thanks for the update. Keep it up, Jane. You are going to be the one cancer cells tell scary stories about, I tell ya. Like so many others here, I keep you in my daily thoughts. Keep thinking your wellness thoughts, Jane. All the filaments of love and strength, may they help you weave your healing. Love, strength, hugs sent your way!